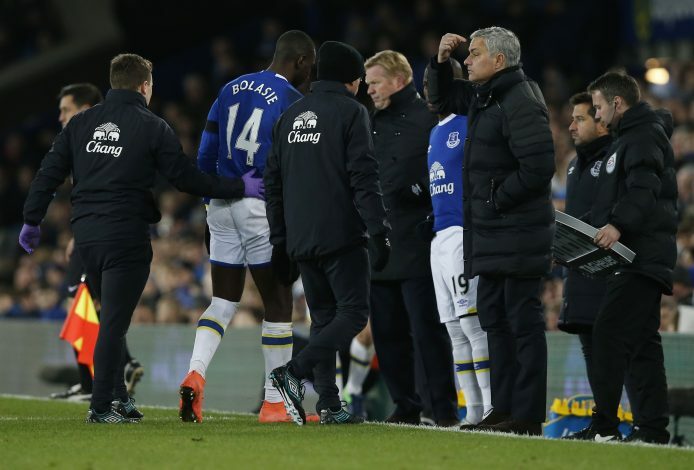 Everton winger Yannick Bolasie suffered a devastating injury during Sunday’s 1-1 draw with Manchester United. The DR Congo international joined Everton from Crystal Palace this summer for a sum of £25 million, and has played all games for the Toffees this season. However, during the previous match, he fell down on the pitch after a tackle from Manchester United’s Anthony Martial. Immediately after the fall, he faced significant pain, and the club’s two medical staffs attended the player. As per scan reports, Bolasie had suffered anterior cruciate ligament damage, and is set to be out for the rest of the season. The injury will leave a big question mark for Everton boss Ronald Koeman on selecting which player to deploy in that position. According to BBC journalist Phil McNulty, Koeman will now go all out in his attempt to secure the services of Memphis Depay. In a recent interview, Koeman expressed his interest in Manchester United winger. The Dutch international is having a tough time at United, and is hardly getting enough game time. Memphis Depay has a contract with Manchester United till 2019. It is highly unlikely that Depay will be sold to Everton, as the youngster has enough time in front of him to fulfill his potential at Old Trafford. But a loan move in January is definitely an option. Yannick Bolasie was Ronald Koeman’s most expensive signing in the summer. But now, Koeman is left with Aaron Lennon, Kevin Mirallas or Gerard Deulofeu as options on the right side.